During my recent planning-and-mind-orienting week, I put my finger on something that's been bothering me about LT -- something that I thought can and should be attacked immediately during RTB. Generally, that something is the lack of visibility of core features that already exist in the engine. There's so much that already exists. There really is. But with the amount of revisions of various kind that we've been through, it's been hard for any of those features to consistently stay on the surface. Broadly, that's sort of the point of RTB. But even more specifically, this week, I decided to concentrate my firepower on the most basic of those areas: the thing you see first and last, the thing that serves up the direct information about your world and your ship, and, most importantly, the thing that is currently far more empty than it should be: the HUD. Yes indeed, have a look below. 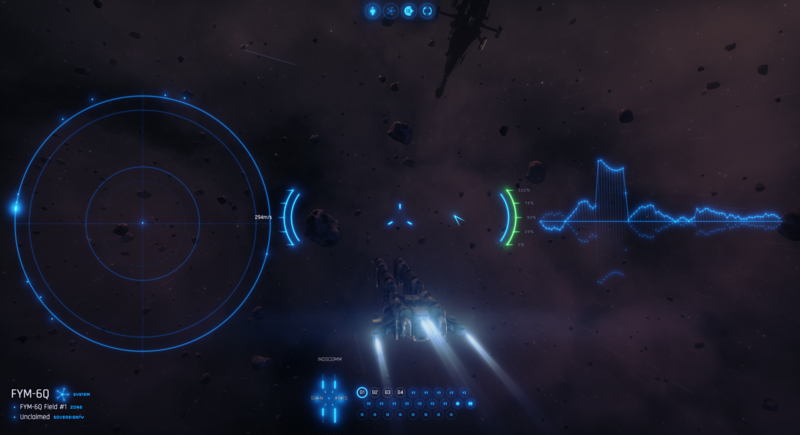 You can eyeball the distance to a pack of enemies using the minimap, identify a mineral-rich rock on the scanner, route all power to the forward deflector shields, and even monitor your personal messages, all without leaving home base. 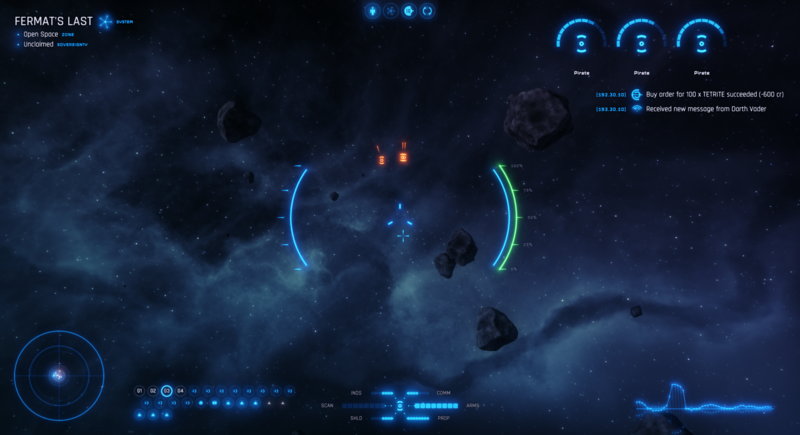 I've also done away with the bottom menu, which was previously a "menu for the thing I'm flying" menu, and replaced it implicitly with HUD elements (since, it turns out, the HUD is also a "menu for the thing I'm flying"!) 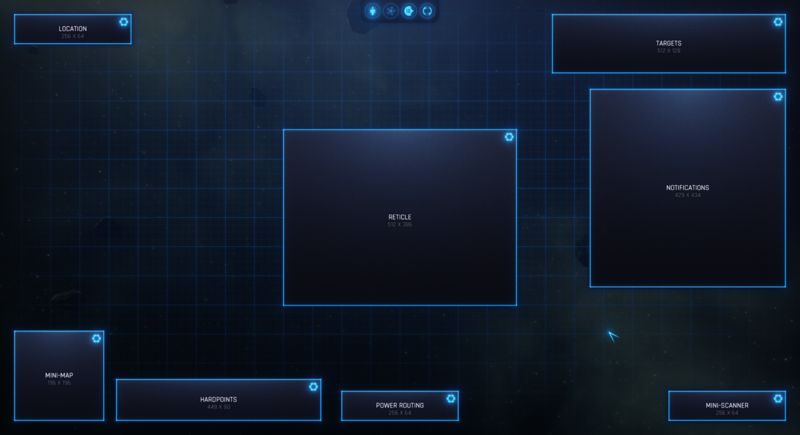 In this picture, for example, clicking the minimap will open the system map in a new window. Clicking the scanner preview will open the full scanner display. Clicking any of the targeted objects from the top-right will open their information window. The same applies to clicking any of the hardpoints in the bottom-left lattice. 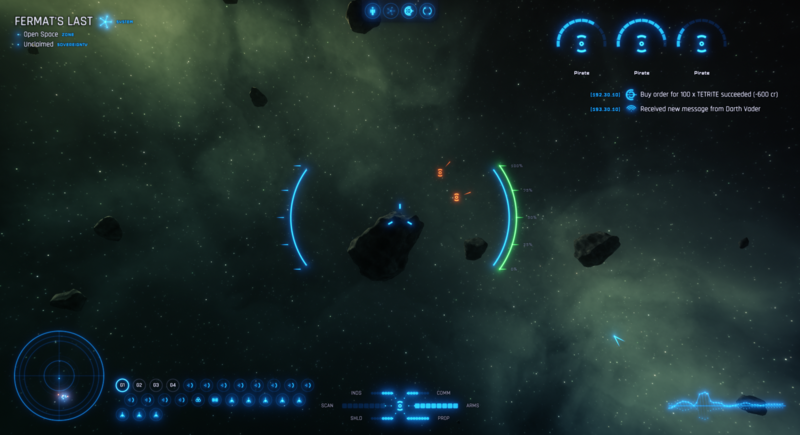 Concretely, this just means that the HUD is fast and simple to use. Although I wasn't able to complete a 'ship summary' widget in the week, I hope to add it as the last (major) missing piece, since it will then provide a link to opening the player's ship window. Every good cap ship pilot knows that having lots of weapons calls for having weapon groups! After all, sometimes bringing down a mosquito doesn't require all the nukes. LT now has equipment groups, and the implementation is very simple. Several control group buttons live alongside the hardpoint nodes. One of these group buttons is always selected at any given time. Right-clicking (or performing an equivalent joy / gamepad action) on a hardpoint node will toggle whether that hardpoint is to be 'active' or not under the current control group (colors and opacity indicate whether the hardpoint is active). The group will remember these toggles, so that when you switch between groups, they'll be preserved. Simple! The number of available control groups can easily be changed as a setting. It's also worth mentioning that the hexagonal lattice layout of the hardpoints is due to a new layout widget implemented this week. The reason I mention is because I'm quite excited to use these lattices in other places. They're ultra space-efficient, but, more than that, I'm seriously impressed by how good they look with comparatively-few frills (compared to a square lattice, for example.) Practical and attractive? Now that's a layout I could fall in love with...! It's nice to finally have some stuff populating the HUD, but no doubt we're all going to have our own opinions of what should go where and how big it should be. In fact, your answer will almost certainly depend on the role(s) that you choose to pursue in game. For this reason, I created a simple and easy mechanism to allow players to customize their HUD without ever leaving the game. 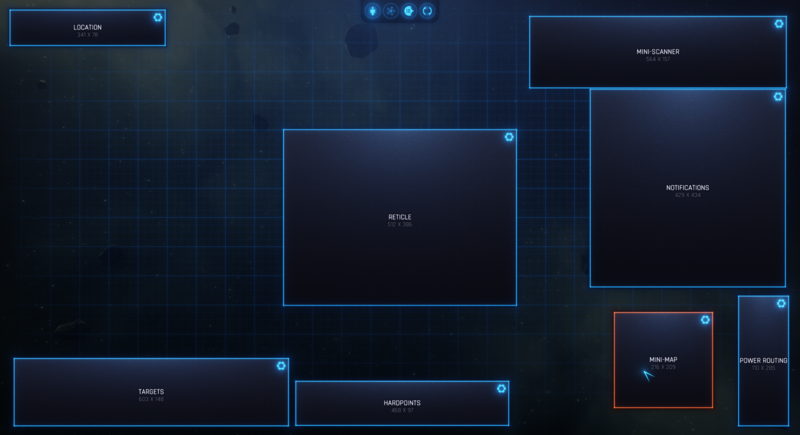 By toggling the HUD's "Edit Mode," HUD widgets will be converted into their proxy 'containers' -- big rectangles -- which can then be repositioned, resized, and (in the future) disabled and reconfigured. I'm very serious about exploration. VERY SERIOUS. In the future, I'd love to add the ability to individually configure each widget (see those gear buttons in edit mode? Some day...). It'd be fantastic to be able to choose the behavior of your minimap, resolution of your scanner preview, shape of your center reticle, etc. all without ever having to leave the HUD (well, in edit mode). But for now, the point is already accomplished -- to give the player some power over that functionality! To let them feel and take control over what LT has to offer. Between having more content available to access from the HUD as you roam around, and having much more power to shape it, there's quite a difference in the feeling of game tactility between last week and today. Steph, Andrew Styles, and 63 more people like this update. That RTB format is very nice. I'd say RTB episode 1 is a success. Just wanted to say - I actually liked the green health bar. Not that I don't like blue - I do! - but the variety of color prevented it from being mundane. I could see the green bar turning yellow when below 50% and red below 20% (for instance) to give easy rough indicators without the player having to look too close. Keep it up Josh. Liking the look of this so far. One thing -- I don't know if or when you'll get to this, but I remember being very intrigued by your earlier coverage of how the economy would work. I believe you said the market would drive prices. Can you go into more depth, ie, if market prices are capped at high/low values and whether we'll be able to find extremely lucrative routes via finding (or creating) a surplus or scarcity of a resource in a system (or multiple systems)? I like diverse trading systems where extremely lucrative routes form from world-(universe-)events, and shift over time as the items are traded more (or less) or more people immigrate or emigrate within a system. Thanks again for this update, I like the tone of the RTB so far and how it really highlights the progress being made. One of THE best updates in quite some time. I LOVE the On-the-Fly HUD Customization. Since I'm pledge for BETA access, I'm quite eager for Beta to arrive, so this Road to Beta series is very welcome! Josh this is very cool work, keep it up. Ooohh that green health bar looks bloody lovely ! This really does look great! Keep up the good work. Thank's for the great update Josh! You are doing a good jobb with LT. One suggestion about colors, maybe we can have an option to choose different base hud colors? I would choose a subtle green color. Nice update and as some other ppl have said, the green health bar is very good. You can see it without having to look directly at it. Also will we actually be able to meet/get messages from (a npc named) darth vader? Thanks for the great update. Just a quick question. Will there still be the option to curve the HUD slightly and have those cool translucency effects we saw in previous update videos? I really liked the look and feel they gave the game. I've been lurking and reading every update and I have to say that the first RTB is looking good! I hope it's not too much time taken out of your production/development time each week, though. Otherwise, it's great to see what's being done towards completion of LT. 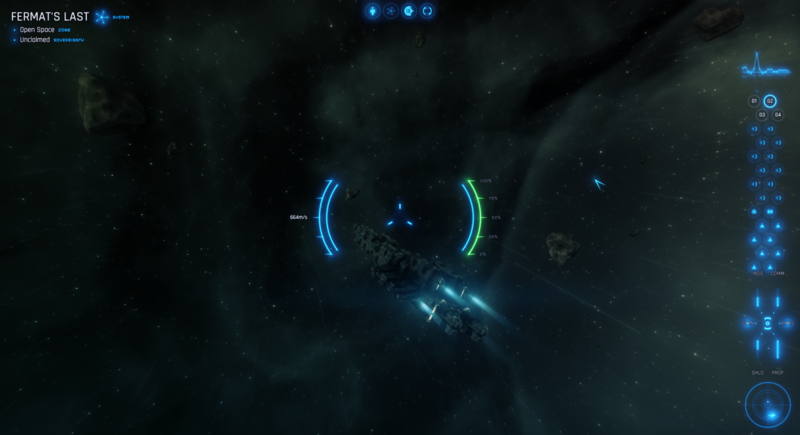 Since I assume that the green indicator will turn red when the ship's health decreases, I'm absolutely fine with it. Otherwise, in all those glowing blue tones, it would be easy to miss this vital information! Not gonna lie, I really like the green health indicator, a bit of extra color in the hud is nice! 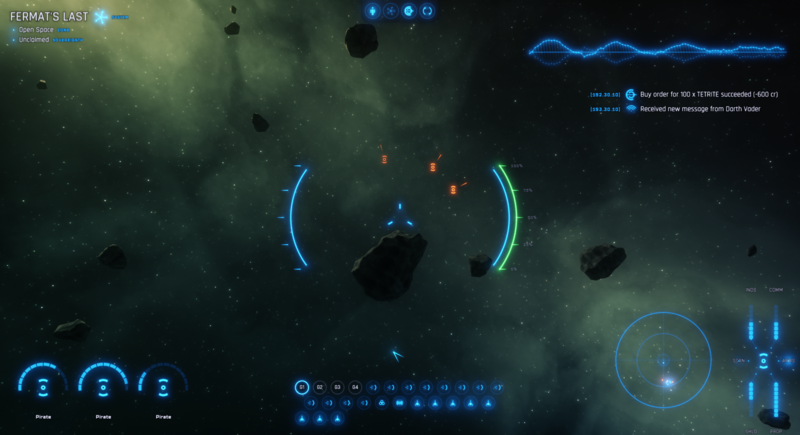 And I like the design of the HUD too, it's a good starting point even if you want to configure your own personal HUD. BTW, I rather have a health indicator that sticks out than have to search for this kind of information in a intense battle while being shot at.